While most people would visit an amusement park to find incredible bright lights like these – one intrepid photographer prefers to scale new heights… on top a 900ft crane. Thrill-seeker Dmitriy Chistoprudov pushes the boundaries to capture his stunning snaps of the bright Moscow lights using a unique skill while aboard the giant structure. 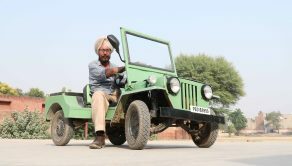 Indian mechanic who never went to school builds ultra small car!